Bruce Thigpen of Eminent Technology introduced his new LFT-16 planar magnetic 3-way bookshelf speakers [$950/pr]. This hybrid combines a 6.5" paper cone woofer below 250Hz with a planar mid and tweeter for a claimed frequency response of 45Hz - 50kHz (-5dB in the treble). Diminutive dimensions for a 3-way are 9.75" W x 21.5" H x 9.75" D but the efficiency is an ET-typical 85dB only, mandating potent amp juice to drive 'em. 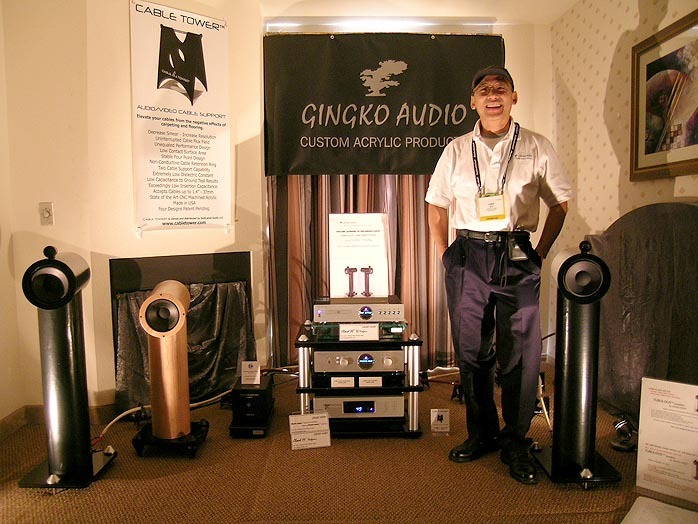 Mike Veretto of ESP, Concert Fidelity/Silicon Arts and Critical Mass Audio [below right] was one of many exhibitors suffering shipping snafus who had to rely on the kindness of strangers to replace, in his case, Tsuda-San's amplifier - and EveAnna Manley snappily loaned him a Snapper. Saludos EveAnna! 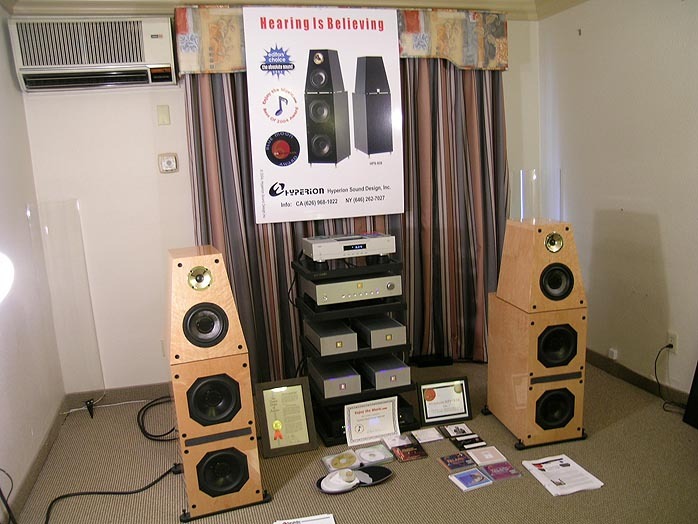 Despite not being powered as intended, the ESP speakers -- like in Denver -- showed once again why they enjoy their repute and why a mastering engineer like Steve Hoffman has chosen them as his personal reference "monitors". 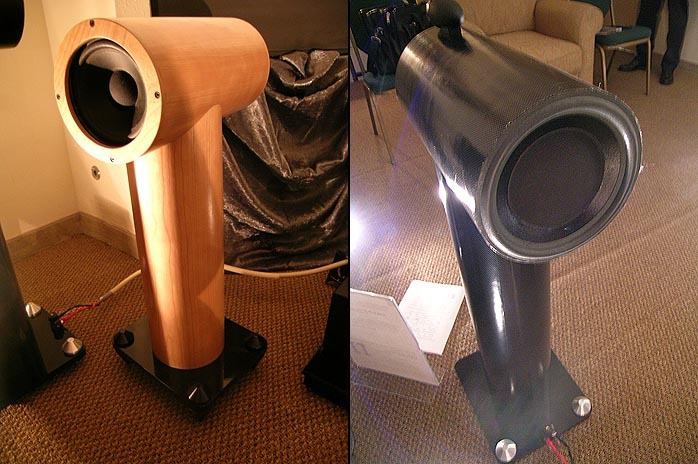 Gingko Audio's Vinh Vu premiered prototypes of his new Tubulous speakers which use paper tubes for their enclosures. These tubes are denser than MDF and due to their high glue content, accept screws just like wood. 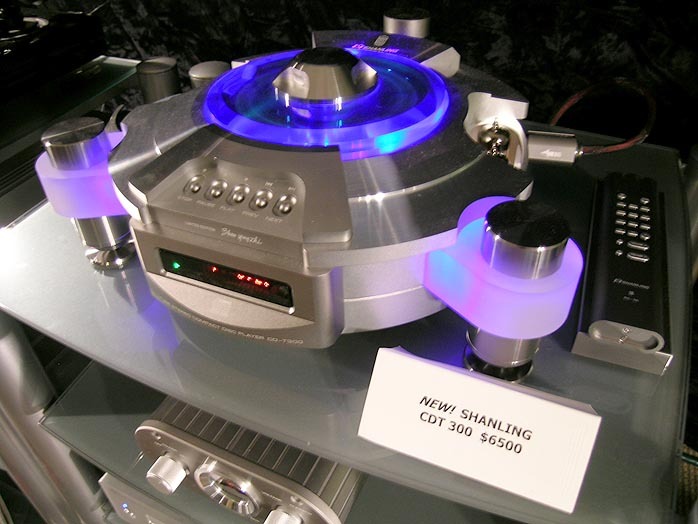 The models on display combined a front-firing mid/woofer with a rear-firing passive radiator and a bullet-type tweeter. The horizontal tube can be rotated inside the scallop of the vertical base which contains the crossover. This fixes the position of the tweeter for optimal soundstaging. The upright tube surrounds a smaller one screwed to the base to support convenient toe-in rotation without moving the plinth. Unique patent-pending technology concerns itself over what's inside the vertical tube but details won't be forthcoming until the patent has been granted. Marketing consultant Jonathan 'J10' Scull hosted a little on-line press meet to give Jim Wang of Harmonic Technology an opportunity to talk about his Cyber Light cables. Those utilize IT technologies to convert the analog input signal to light and back to analog at the tail end without invoking any A/D or D/A conversion. Lengths of 71 miles pose no signal-loss issues to fiber optic transmissions since those are inherently immune to RFI, EMI, impedance variations and the usual inductance and resistance values that plague metal-based conductors. Three moonies presently own these cables and their findings will be published as reports show up on my desk. If you thought nothing new happened in the snake pit of cable claims, think again. These Cyber Light cables are rather revolutionary and promise elimination of certain challenges that have remained endemic to all metal-based wires. While David Robinson of PFO was busy capturing candid pix of the presenters [left right], my crew was under strict orders to play elitist snotty press to give Jonathan Scull [far right] who now represents manufacturers and thus plays the other side of the fence a hard time. Just kidding. While us moonies may be many things, snobby and elitist are not items on our to-do itinerary. If we ever develop those tendencies, please remove us from your web browser's favorites list! 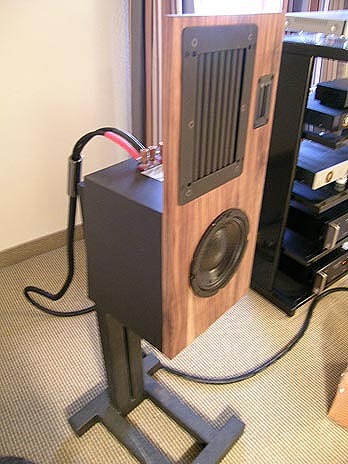 Hyperion Sound introduced their accoladed HPS-938s in a stunning high-gloss wood veneer which fronted a $10K-total system that began with an affordable CEC belt-driven CD player and continued with Hyperion's remote-controlled preamp and half-width monos - definitive high-value gear but not at all adverse to be taken for very serious testing. 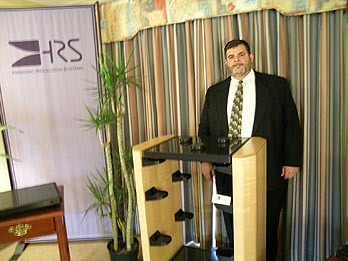 Mike Latvis of Harmonic Resolution Systems had his statement-level resonance attenuation rack in multiple exhibits and promised that his high-priced best effort previously reviewed in these pages would shortly see trickle-down implementations into more affordable realms. balance adjustments outside the signal path. Once Steve's in production with this exciting board, expect an interview. We will report in detail on his latest invention and how to go about obtaining it as both DIYs and electronics manufacturers. While we're still in resonance control land, a friendly reminder from the Good Vibes Police: If you haven't as yet addressed this pesky issue, you owe it to your hardware and software investments to investigate the comprehensive effects that performance-based stand/rack solutions will have on your system. Like audiophile cables prior to Noel Lee (who's since and inexplicably gone off the deep end with his legal extortions of businesses who use the term 'Monster' in their names), resonance attenuation in component supports is still eyed with suspicion. But we're slowly exiting the Dark Ages in this regard. While this relatively new field invites plenty of nonsensical claims and products that are more fancy than fact, a diligent audiophile nowadays has quite a few options that truly work because they're based on hard verifiable and measurable science. Still, it remains common for reviewers to downplay their effects and avoid looking gullible. Fact is, properly engineered resonance control solutions are a mandatory presence in any dialed-to-the-max music or home theater system. GPA, HRS and Silent Running are firms that should be on your radar in this category. 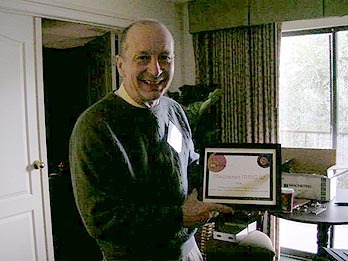 Magnepan's Wendel Diller [left with John Potis' Blue Moon Award for his overachieving MGM speakers] was eager to dispel notions that the firm hadn't introduced anything new in a while and thus fallen off the innovation's bandwagon. Not. 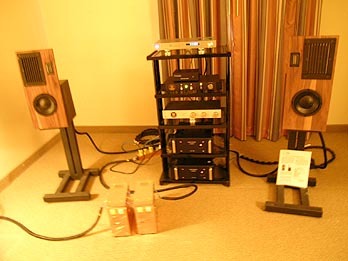 For 2005, Magnepan introduced a dedicated center channel ($2,500) to perform Home Theater and multi-channel music duties for those who can't or don't want to mount two MGMs directly adjacent to the screen as John described in his review. Magnepan enjoys one of the most unique customer loyalities in all of HighEnd's fiefdom and Wendel's demo explained why - it's a wonderfully coherent, of-one-piece and wall-to-wall sound experience. Dan Wright's ModWright SWL 9.0 tube linestage [[$1,400/$1,500 with remote] is now in full production and available also in SE version [$1,900]. One lucky moonie will get one of these -122dB S/N, 200kHz treble extension units for review shortly. For gonzo looks and lust-inducing come-hither vibes, Roy Hall's new Shanling transport/CDP took top honors in the Alexis Park.